‘You have no bucket, sir,’ she answered ‘and the well is deep: how could you get this living water? 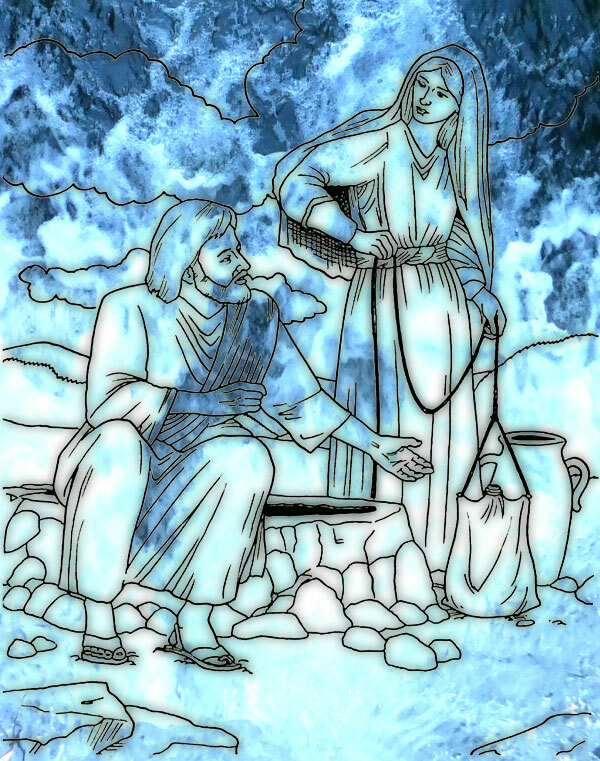 A famous picture has the Samaritan woman looking into the well and seeing there her image – and image of Jesus. In the depths of the well of her life, is the presence of Jesus. You need sometimes to go to the depths of the well…finding God in all things…where they affect us – love, pain, death, decision, joy, – we find God. God is near when we are near to ourselves, even in shame and sin. We thirst for meaning in life, for knowing we are totally loved, for community and companionship – this is the offering of God. The living water is the holy Spirit. We thirst for inclusion – the disciples in this story did not want Jesus talking to a woman. So much of the religion of the time separated people – religion, tribes. In the depths of the well we are all equal. In the well we see everyone and can rediscover our common roots – and a big one is we are children of God. Neither Jew nor Samaritan. And you find the mercy of God in the well. As we go into depths of prayer and ourselves we are open to mercy. We may puts all sorts of conditions on God’s mercy and forgiveness – naming our sins, counting the numbers of them. God doesn’t number sins but forgives them and covers them over with love. At the bottom of the well is the water of mercy. The face of a bighearted God with a smile and an inviting face…to spread to the world like the woman did. Of the mercy of God, Pope Francis says – “there is no sin or crime of any kind that can erase from the mind or heart of God even one of the children he has created”. This entry was posted in Gospel of John, Gospel Reflection, Liturgy Resources, Prayer Resources, Scripture and tagged Deep well, Donal Neary SJ, God's Mercy, Gospel Reflection, Jesus, John 4:5-42, Lord Jesus, March 23rd 2014, Mercy, Messiah, prayer and action, Samaritan woman, Samaritans, saviour of the world, Scripture and Reflection for 3rd Sunday of Lent Year A, springs of eternal life, Sunday Gospel and Reflection for 23rd March 2014, Third Sunday of Lent.